I fell asleep shortly after dinner yesterday on the couch. I woke up groggy but noticed all my sons sleeping around me. I got in trouble before falling asleep watching UFC, only to wake up to Irresponsible Spoiled Sluts Gone Wild, so I have to monitor what station I watch before I retire. Heck you can’t even leave it on the Cartoon Network at night anymore due to Adult Swim. Flipping through the stations I searched for something to watch before I passed out again. I usually leave it on ESPN or NFL Network, but figured I’d be nice and put on something for them. I was annoyed with PBS Kids, Disney, Toon Disney, Disney HD, Nick Jr, hell even Nick Sr…so I flipped it to Boomerang. Figured I’d go old school and fall asleep to cartoons I grew up with. Now something about me – I hate sleeping with a TV on because it influences my dreams. If something comes on like Criminal Minds, CSI or Law & Order I will have some ol crazy dream about solving crimes in my underwear standing barefoot on warm cookie sheets, so I try to keep it on sports or make sure the TV timer is on. I passed out as expected and woke up groggy again…this time faintly hearing the dialogue on the television. I swear they were talking about playing craps. I got up thinking what type cartoon is this? I drank some water to wake up. I stood there watching as this cartoon, Top Cat, was negotiating with a bookie. I am not making this stuff up. He owed somebody $50 and he was trying all these hustles to get the bread to pay back this thug. 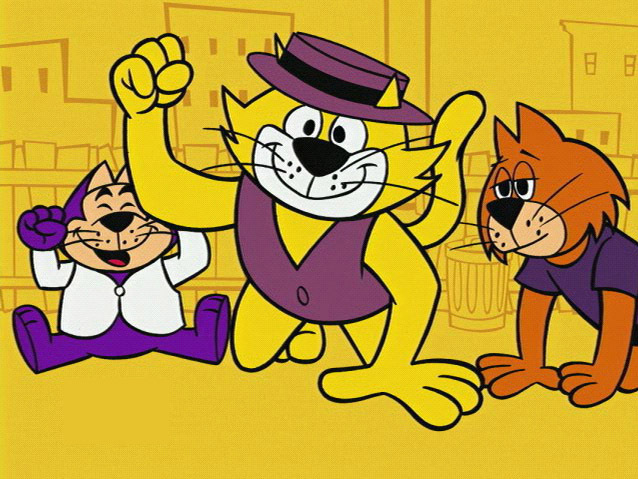 Top Cat went to an officer and pretended to be a producer or something to hustle him for some investment money. He even dressed like a hustler – like he bought his purple hat & matching vest from downtown Detroit. I sat there thinking…man this is what America used to be about. Our cartoons and shows were so gritty. Bugs Bunny & Elmer Fudd taught us how to bust caps if there is a disagreement. Our shows taught real life stuff – like how to hustle and pull women. 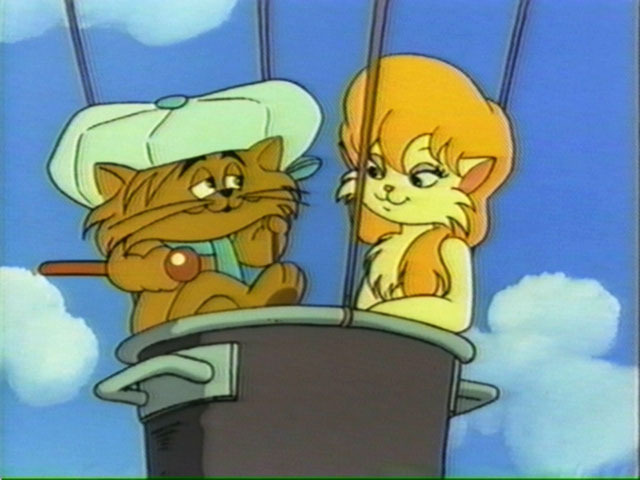 Remember Heathcliff? There was a pimp on the show named Riff Raff. He was like a record producer or something and drove a Cadillac that transformed into a boat and a camper. He wore an old school Kangol and even had a fine kitty sista on his arm. Our cartoons also taught us morals. Smurfette for instance. She was one female in a village with 99 other dudes and was treated like a queen. She learned how to manipulate without being the town whore. Flinstones taught us that even ugly dudes with big heads can pull pretty chicks. Scooby Doo taught us how to reason and recognize a scam artist. He-Man & She-Ra taught us about steroids. The Muppet Babies and Alvin & the Chipmunks taught us how to harmonize without Autotune. Inspector Gadget taught us that women do all the hard work while men take credit for it. GI Joe introduced us to terrorism and how to fight it. ShirtTales taughts us that you could make a decent living being a T-Shirt designer if you have a hot slogan. Richie Rich taught us that rich kids live better than poor kids, and you’ll never be happy unless you make money. All these things in cartoons were the moral fabric that kept this society together! But now what do we have? Zack and Cody? Hanna Montana? That’s so Raven? Heck they don’t even watch cartoons unless they are computer generated like Pixar films. All these fruity shows that don’t teach them anything but annoying humor and how to be soft and whiny. We never wore bike helmets, we just took our concussions like little men (and women). Neosporin? Heck you best pour some peroxide on it and keep it moving. Videogames? Naw, we played sports and pretended (there’s a concept). Our imaginations were unlimited. If we didn’t have access to it, we’d create it. Take an old crate, some nails, a hammer and build a basketball rim. We didn’t have Gatorade…we drank out the water hose. The fat kids in school we could all name. There were only a handful in the entire school. Now it’s the opposite…and you have to name the skinny kids or the ones in shape. We were rewarded with pizza parties. They are numb to that as they eat pizza everyday now. In my day we had concrete playgrounds, not any of that woodchip, recycled tires crap. I will find some of my grade school classmates to confirm this, but we had this two-story death trap at my elementary school (Edison). This thing had to be two stories tall and every kid had to climb to the top of this monstrous beast at least once. Every year we had a kid break his arm falling off that monkey bar. Thing is, in my era even the fat kids were somewhat athletic and they never cried – even in gym class when we had to climb the rope 40 ft in the air with nothing to catch us but a decrepit gym teacher and a 2-inch foam mat. Kids don’t even play dodgeball in school anymore. My son came to me and told me they played frisbee dodgeball. I looked at him and scrunched my face up like, “What in the hell is frisbee dodgeball?” They are making these kids so soft. We played with old tattered soccer and volleyballs with the leather hanging off. We had whelps on us after the games, but we never complained as it built character. It taught us how to compete. Something this generation is missing because all those nerds we used to throw dodgeballs at went to therapy for it, then got their doctorates, jumped on these school boards and tried to change the rules because of their issues with being lazy and nonathletic back in elementary school and always picked last. Let me give you an example of what my friend coins, the __ssification of America’s youth. Field Day 2010…versus Field Day 1986. My sons showed me the list of their events for Field Day this year. They had noodle spray, water race track, mentos diet coke explosion, puzzle pipes, and just…man, just a string of gay events my brain can’t even remember. Their ideal was to make it less competitive and more about fun where everyone is a winner! Em…sorry…not everyone is a winner in life. In our era we worked out weeks in advance preparing for and anticipating Field Day. We had real events…like races. I remember all the chatter among friends about the events and what we would dominate. Friendly trash talk started weeks before until the day of. We competed hard, and at the end of the field day we left it all out on the field. We would pin all them to our shirts and couldn’t wait to see who had the most blue or red ribbons. And you best not be the kid who didn’t win anything and just had the green participation ribbon. We are getting away from some of the crooked core values that this country was built on. We are losing the fundamentals of competition and growing to be a nation of some whiny bastards. 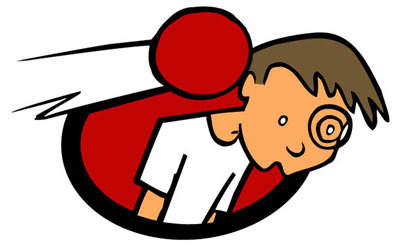 We need to get back to basics…hustling cartoons, dodgeball and outright competition. I think we can all agree that life was a lot more fulfilling then…that is unless you were one of the kids with the green ribbons.